The Senior Coastsiders hosted my 2nd book making class offered in Half Moon Bay. Open to all ages with first class spots reserved for elders, we ended up with a mix of ages. Two women brought their daughters. I first taught how to make the hard covers and how to integrate that with the accordion folded pages. Then the participants took off running, using collaging materials, pens, pencils, sequins, magazines to embellish their interior pages. Everyone created something special. One woman created a memory book for a sick friend. I especially enjoyed watching the mother/daughter interaction. What a wonderful way for them to spend a couple of hours together. I look forward to offering more book making classes soon. Kitsune Community Studio had a bit of a break, but things are getting rolling again. I am expanding to conduct some talks and classes in other locations. So I hope to see you in some of these venues too. I’m planning an open studio evening in April and I’ll keep you posted! Book Club Alive and Kicking! It’s the one year birthday of our club! This has been truly inspirational in getting many of us reading again. Please join us, for discussion and snacks. Contact me at judyshintani@yahoo.com for more info. Your Aunt Doesn’t Want Your Art Exhibited in Seattle, Now What? Sometimes the ones you love are your toughest art critics or maybe they just don’t say anything about your work. But what do you do when they call at midnight and ask you to pull out of an art exhibit that is opening in a week? Come hear me talk about family censorship and how I dealt with it. We have a hunch others have stories about this touchy issue and want to hear your experiences too. 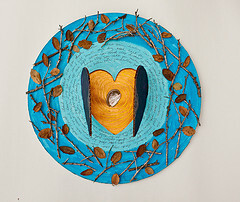 Almost everyone is concerned about his or her health, but how often do we create art to honor our wellbeing? In this workshop you will have the opportunity to focus on your health using meditation, writing, art making, and sharing. Artists can choose to give attention to on an issue or to honor their body. For example participants may choose their hands challenged by carp tunnel, or their heart due to sadness, or pay tribute to their strong legs that have carried them throughout their lives. We will explore and discuss the power of intention, and learnings that arise out of artistic concentration. Examples will be shown of how different cultures and artists have used art and symbology for healing, health, and expression. A variety of materials will be provided for artists to pick and choose and they may also bring their own media. I’m teaching these two classes with the Senior Coastsiders at Ted Adcock Community Center. Seniors 60+ get first signups, but the class is open to others too. There is a very reduced fee for the class. Great way to get your feet wet making books and experience taking a class with me too. Learn how to make softbound books that can be used for journaling and make nice gifts too. Learn how to do pamphlet stitch binding, and decorate the covers with paint, and collaging. Learn how to make an accordion book and embellish and collage the pages and cover. Thank you for your continued interest in Kitsune Community Art Studio! Contact me for more info on events and if you have an idea or need a venue. Love this idea of connecting health, exercise, and energy! Converting the wasted the kinetic motion of treadmills, elliptical machines, and stationary bikes, into renewable energy is cost-effective and energy-efficient -that’s what a community organization in Detroit did this week with its new green gym, for people living in its transitional housing and other shelter programs, staff and volunteers. “Not only is this gym a good idea for the environment, but it will help build the general health of our clients who often struggle with diabetes or heart disease,” states Rev. Faith Fowler, the executive director. The Cass Green Gym’s facility offers weight machines, boxing bags, a treadmill, and stationary bikes featuring Green Revolution technology that generates electricity. Cass Community Social Services (CCSS), located on Detroit’s Cass Avenue, projects that full classes with ten people, is enough power to light three homes for an entire year. It will redirect it back to the building’s electrical grid, reducing operating costs. Read more at treehugger. 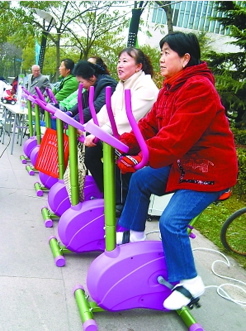 Six exercise bikes lined up in the street of Beijing’s Fengtei district look like toys with their bright purple and chartreuse components, and the senior citizens riding the bikes certainly don’t seem like they are trying to get anywhere fast – in the clip they are barely pushing the pedals hard enough to keep the bikes in motion. But these retirees are proud that they are not only getting exercise to maintain their health – they are also generating around 180 watts of power per hour, saved to a row of batteries that are later dropped off to low-income local residents to run TVs and other electric devices. It’s senior power at its best. Read more at treehugger. Telling a story about an ancestor can be a gift to oneself and to one’s family. It is powerful to have your stories heard. It is a great community building experience too, because it allows others to think about their own ancestors and stories. 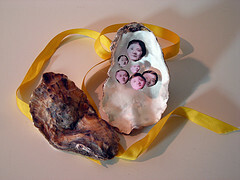 Here is how Lisa Petrides and I created “Grandmothers from far lands” together. We did a meditation to ask our grandmothers what they wanted conveyed in our storytelling. Then we both took some individual time to write down some of the things we remembered about our grandmothers. We thought about their history, things we liked about them, some hardships, our relationship with these women. We got together and shared these stories and discovered that there were similar veins, for example, both our grandmothers had arranged marriages. It was through these marriages that they came to America. We also began to notice how different their lives were in America. Lisa’s grandmother lived in a city and my grandmother lived in a houseboat. Culturally their temperaments and styles were also a contrast we worked with. We used the time line as the flow of the story. We started in their native countries and traveled over the ocean to America. We walked, following the shape of an infinity sign, to tell about the long ship journey. We brought in props which anchored their stories and clued viewers into where they were and what they were doing. As we took turns speaking, the other person swept the floor behind them. Lisa spoke in her grandmother’s voice as she washed dishes, and I was my grandmother as she washed the rice. If at all possible practice in the space you will be performing in. This allows you to be more familiar with the sound level, lighting, seating, etc. If that isn’t possible, envision the space as you practice elsewhere. Before two shows we invited some folks in to critique our performance. We got some great feedback about background music and adding movement. We were able to make some changes which improved the show. We did some advertising and promotion through the local newspapers, email, postcards, and posters. After doing all that preparation, it is nice to have an audience! Of course that all took some advance planning since the pr had to be out almost a month ahead of time. On the day of the performance try to take it easy so you will be at your best. We passed out brief programs so the audience could have something to read and follow what we were doing. We did a little introduction and then went into the 15 minute performance. At the end we invited the audience to participate by standing and speaking their own grandmother’s name and many did so. Lisa and I have changed the performance each time we have done it. Sometimes it depended on the venue. We have told our grandmothers’ stories in an art gallery, a senior center, and at a yoga center. It is important to keep in mind who you are telling the story to. For example if I were to do it for seniors again, I would invite them to have a sharing session afterwards so they could share their own tales. Sometimes the stories change themselves, revealing more memories to incorporate in the performance. Sometimes we change in the way we want to speak. Allow for fun, change, and mystery that evolves with memories and storytelling. Provide your students with a list of questions and possible ancestor they can research. Have them bring in photographs and stories they have gathered. The students will break into groups based on which ancestors they selected. They will meet and discuss similarities and contrasts. Have them write up a 15 minute script and practice their performance. Document their presentations using video and photography. Unwilling to stuff envelopes or go off quietly to the sidelines, thousands of innovators in their 50s, 60s, 70s and beyond are combining their creativity and experience to address big social problems. These change-makers are taking matters into their own hands and fashioning a new vision of the second half of life, one in which the expertise and talent of a lifetime is refocused on finding solutions to challenges in our communities, our country, and the world. The Purpose Prize, now in its fourth year, provides five $100,000 and five $50,000 awards to social innovators over 60 in encore careers. It is the nation’s only large-scale investment in social innovators in the second half of life. Rather than a lifetime achievement award, however, The Purpose Prize is a down payment on what these 60-plus innovators will do next. Read more by clicking here. I enjoy facilitating an Elders’ art class in San Francisco every Friday. For the past 6 weeks we have been focusing on mandalas. I discussed the sacredness of the circle symbol in many cultures, in nature, and in religion. We designed rose window mandalas based on the cathedral stained glass windows of Europe. We made shield mandalas to give us strength. For the eco mandala inspiration, my two high school aids presented a report on Andy Goldsworthy and showed how he used things found in the environment, nature ,to create installations. I scavenged materials for the mandala creating: rose petals from the flower place on highway 92, rocks left over from Carla’s landscaping job, different kinds of rocks and colors from Home Depot, and fallen ginkgo leaves in front of Judy Johnson-Williams house. The biggest score though was from Alena Jean’s Flower Shop. Her dad had just finished pruning and I grabbed beautiful plum branches, geranium leaves, lily flower petals. The only instructions I gave the elders were to think about: balance, color, texture, placement, and the centers of their mandalas. The elders went right to it and came up with some beautiful designs. Some of them left a lot of black around their materials, so the shapes of each petal and leaf was defined. Others piled the materials on. I found the project to be very successful for the many different issues that the elders have: hearing loss, stroke restriction, language differences, memory and cognitive variation. Everyone was able to create the mandalas and they enjoyed seeing what their fellow students had done.